Hotel Bellevue Dubrovnik has one of the most envious locations among the Dubrovnik luxury hotels. Most rooms offer amazing view of the blue Adriatic sea. This hotel is perfectly located half way between the Old Town (15 minutes walk or 5 minutes bus ride) and the ferry port. Hotel Bellevue Dubrovnik offers the most unique rooms and suites that cannot be found elsewhere. All bedrooms have simple furniture and wooden floors. Bathrooms are uncluttered, functional and comfortable, tiled in light marble. Room amenities include en-suite bathrooms, interactive TV, mini bar, flat screen satellite TV, safety deposit box, hair-dryer, bathrobes and slippers, exclusive toiletries, direct dial phone, pay TV featuring a list of the latest movies, free wireless Internet access. Restaurant Vapor offers the most refined dishes from an international menu with a few carefully chosen Dalmatian dishes, served in a peaceful and intimate setting to the fine selection of best quality wines. Restaurant Nevera is a beach restaurant and it is the perfect choice if you wish to taste the menu with influences from Dalmatia, Asia and the Western Pacific. Spice Lounge is the main bar of the hotel with a magnificent panoramic sea view. It offers Viennese coffee specialities and sweets, fine wines, draft beers, cocktails, and French champagnes by the glass - all served in this intimate, natural and pleasant ambience. In a cove below the hotel lies a pebble beach with sun beds on a deck reserved for hotel guests. Hotel also has indoor swimming pool with a sea view. The Comfort Zone Spa Centre, offers a variety of massage treatments and beauty services. Guests may relax in the sauna or the spa tub, or soak up the view from the indoor swimming pool. Spa facilities includes 500m2 spa and wellness area, oval fresh water pool, jacuzzi, Turkish bath and Finish sauna, theme showers with hot and cold experience, 2 treatment rooms, 1 VIP treatment room for tow with jacuzzi, fitness studio with cardio and strength equipment, relax zone. Free wireless internet is available in all areas and is free of charge. 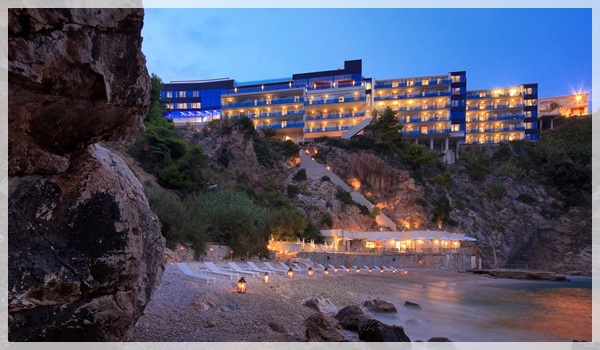 Hotel Bellevue offers some of the most modern meeting venues in Dubrovnik. The ideal spaces for incentives, board meetings, presentations, smaller conferences and gala dinners, they are equipped with the latest audio-visual equipment. If you need to reach Hotel Bellevue from Dubrovnik airport take the airport shuttle bus to Pile Gate and change there for buses no.4 or no.5 (5 minutes bus ride) until you reach the bus stop across the hotel. If you prefer more comfortable and faster transfer you should prebook your private car transfer from the airport. In only 10 minutes you can reach the Gruz port or otherwise take city bus no.7 from the nearby bus stop. If arriving by car Hotel Bellevue has its own parking area next to the hotel.